TGA operates from metropolitan and regional depots throughout Australia. We employ some 600 accredited traffic controllers throughout Australia supported by a fleet of over 350 special purpose traffic control and safety vehicles. As a leader in our field, we place great emphasis on safety and have been responsible for many class–leading safety initiatives including the introduction of Truck Mounted Attenuators and specially developed Cone Laying Vehicles to our fleet. Specialist TGA Fleet supervisors are responsible for monitoring and managing vehicle availability, maintenance and repairs at the operational level, utilising a best practice fleet management software system. We have a comprehensive fleet maintenance and service program from daily inspections through to log book servicing compliant with relevant Australian Standards and vehicle manufacturers’ specifications. In this way TGA can provide documentary evidence to satisfy our clients that all plant and equipment provided for their important projects has been maintained and serviced correctly. 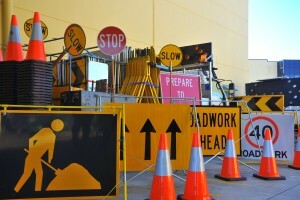 All TGA traffic management vehicles are equipped with signage which complies with the requirements of all state and territory roads departments based on the principles contained in the Australian Standard Manual of Uniform Traffic Control Devices.